The Amalgamated Clothing Workers of America was a United States labor union known for its support for “social unionism” and progressive political causes. Led by Sidney Hillman for its first thirty years, it helped found the Congress of Industrial Organizations. It merged with the Textile Workers Union of America in 1976 to form the Amalgamated Clothing and Textile Workers Union, which merged with the International Ladies’ Garment Workers’ Union in 1995 to create the Union of Needletrades, Industrial and Textile Employees (UNITE). UNITE merged in 2004 with the Hotel Employees and Restaurant Employees Union (HERE) in 2004 to create a new union known as UNITE HERE. In 1931 Sidney Hillman resolved to act against Buchalter, Beckerman and Orlofsky. 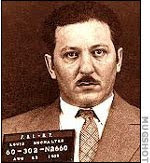 He began by orchestrating public demands on Jimmy Walker, the corrupt Tammany Hall Mayor of New York, to crack down on racketeering in the garment district, Hillman then proceeded to seize control of Local 4, expelling Beckerman and Orlofsky from tech union, then taking action against corrupt union officials in Newark, New Jersey. The union then struck a number of manufacturers to bar the subcontracting of work to non-union or cut rate contractors in Pennsylvania and New Jersey. In the course of that strike the union picketed a number of trucks run by Buchalter’s companies to prevent them from bringing finished goods back to New York. While the campaign cleaned up the ACW, it did not drive Buchalter out of the industry. The union may, in fact, have made a deal of some sort with Buchalter, although no evidence has ever surfaced, despite intensive efforts of political opponents of the union, such as Thomas Dewey and Westbrook Pegler, to find it. UNITE HERE is a labor union in the United States and Canada with more than 265,000 active members The union’s members work predominantly in the hotel, food service, laundry, warehouse, and casino gaming industries. The union was formed in 2004 by the merger of UNITE (formerly the Union of Needletrades, Industrial, and Textile Employees) and HERE (Hotel Employees and Restaurant Employees International Union). In 2005, UNITE HERE withdrew from the AFL-CIO and joined the Change to Win Federation, along with several other unions, including the Teamsters, SEIU and the UFCW. In May 2009 union president Bruce Raynor (originally from UNITE) left UNITE HERE, taking with him numerous local unions and between 105,000 and 150,000 members, mostly garment workers. They formed a new Service Employees International Union (SEIU) affiliate called Workers United.